In Thailand, the new year is celebrated in mid-april, on the occasion of the lunar new year. This traditional festival is also celebrated at the House of Hope! For those of you who are somewhat familiar with Thailand, the word “Songkran” will certainly bring back “watery” memories. Massive water battles take place around the country during the Thai New Year in the hottest period of the year and everyone is having a good time! However, in the beginning, the water guns and buckets of ice water thrown on the backs of passers-by were not included in the rituals of this annual feast. 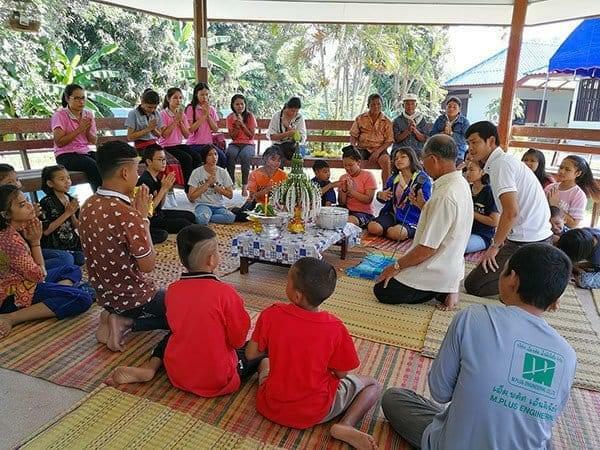 Traditionally, the festival extending on several days is an opportunity for families to get together and to participate in different ceremonies organised inside communities, often in the Buddhist village temple. Among the various rituals observed during the festivities, the tribute paid to the elders is an important one. Jasmine scented lustral water is poured onto the hands of older people who, in turn, bless the younger ones. Inside the temples, offerings are made to monks and sand pyramids are erected and planted with colourful flags to represent the house of the spirits of the dead. At the House of Hope, the children have been invited with their family to celebrate this event together. It is an excellent opportunity to strengthen family ties in a festive and traditional setting. A meal was also offered to the monks of the village’s temple and certain members of the community joined the festivities. A solemn and respectful moment that perfectly fits with the desire of La Chaîne de l’Espoir to further encourage the involvement of the families, whose children benefit from the social and educational activities of the House of Hope. Merry Songkran and a happy New Year to everyone of you from all the children and the local team!